This is the body of the email. This is another line in the email body. Note: <enter> means hit the enter key, and <ctrl + d> means type 'd' while holding the control key. However, this won't actually send an email unless you have a mail server running. 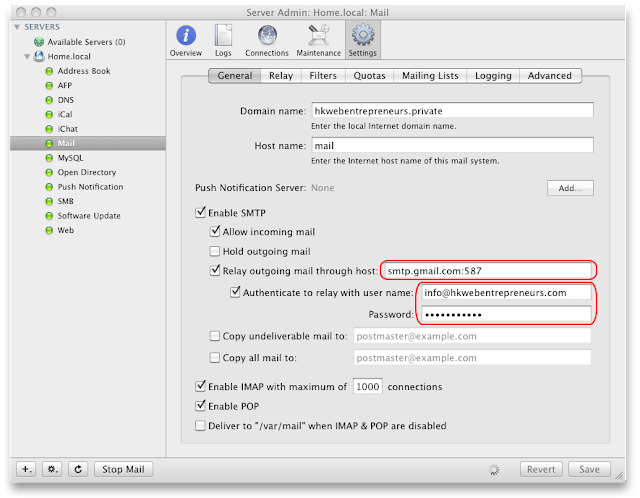 As far as I can tell, you have two options for setting up a mail server - either churn out a series of incomprehensible commands in a Terminal window, or use Mac OS X Server's Server Admin utility to configure the Mail Service using a (somewhat) friendly GUI. I went for the latter option - I just wanted to get this up and running using my gmail account with the minimum of fuss. Unfortunately, it didn't work right off the bat - having configured the gmail smtp server along with my username and password, I was seeing frustrating "Timed out" errors in the logs and my test mails weren't getting sent. Turns out some ISPs block port 25 - so I needed to specify port 587 in the hostname. Then I was getting some even more meaningless errors along the lines of "Must issue a STARTTLS command first". I mean what is that? Thankfully, google to the rescue again - this great blog had all the answers. Note: the gmail account you specify in the "Authenticate to relay with user name:" box will be used as the From Address for all emails you send from the command line. That's it - you can now send mails from a Terminal window! After that, I stopped and started Mail using the Server application, and command-line email now worked correctly.